I really, really, REALLY try not to play favorites because I work with wonderful couples regularly. In fact, I feel beyond grateful that since 2014 I have worked with people who inspire me both professionally and personally. Some of these couples I've known for a while, and some I only met through being their photographer. Many, I'm pleased to say, I have lasting relationships with. However, I suppose I'm a bit partial to Brandon and David because, in the past year and a half since we've met, I've come to love these two like family. Brandon and I especially have developed a super close relationship, and I now consider him one of my dearest friends. His friendship has brought me immeasurable support and joy over the past year. He is the most caring, motivated, organized and thoughtful person I've ever met. David is driven, wry, empathetic, crazy smart, and charitable. Together, Brandon and David are two of the most genuine, generous and kind humans on the planet. So really, how could I not fall in love with these guys? The three of us were introduced by our mutual friend Marissa Digirolamo of Studio Posy, who was creating their wedding day florals. Somehow she knew that we would get on, but I don't think she knew just how well! From the moment we sat down together at The Green Onion to feel each other out, it was kismet! (UGH! I am getting TEARY writing this. I am an emotional gal, but this is another level). 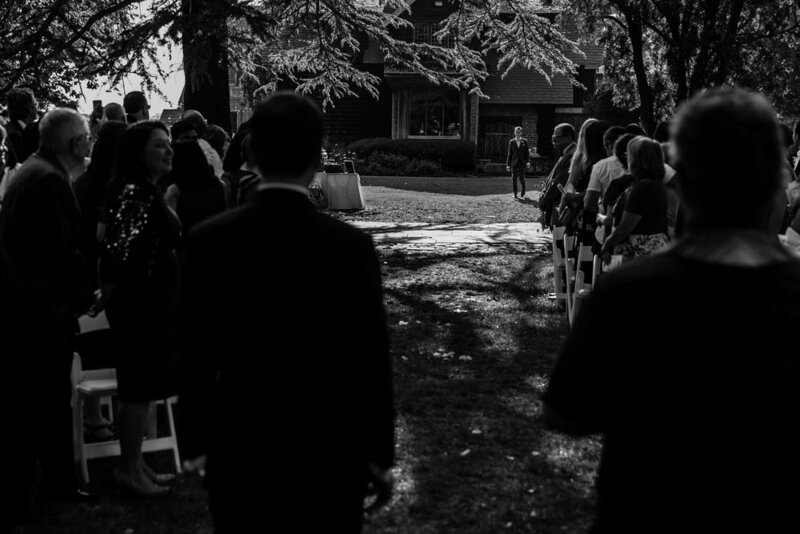 Each and every detail of Brandon and David's wedding day was well thought out, personalized, and executed beautifully by a stellar vendor team. 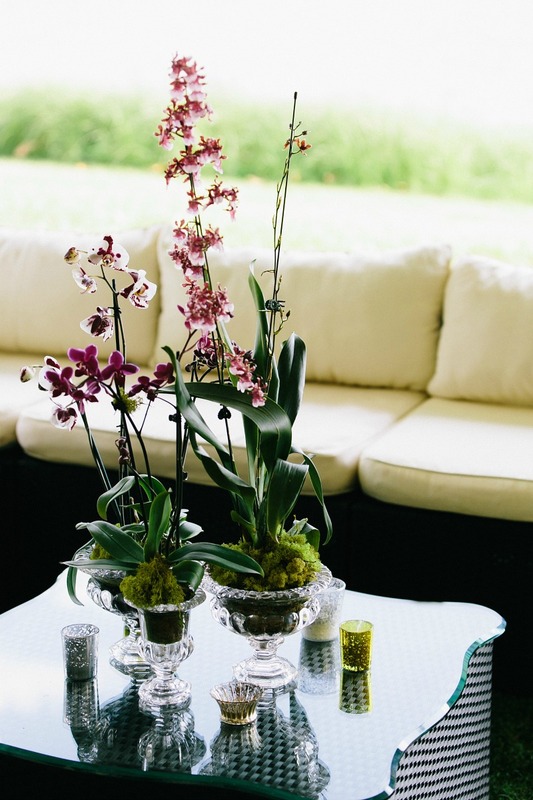 Wanting to have an intimate garden party vibe, compliment the Hermitage's surrounding gardens, and to "reflect the quiet elegance of the venue" Brandon and David worked with Marissa to create a lush array of arrangements-- from wildflowers to modern orchid displays. Bachelor's Buttons particularly hold a special place in Brandon's heart and were selected in memory of his grandmother who inspired his love of flowers. "Bold colors, including deep pops of blue complimented the groom's attire and allowed for seasonal flowers to be utilized." 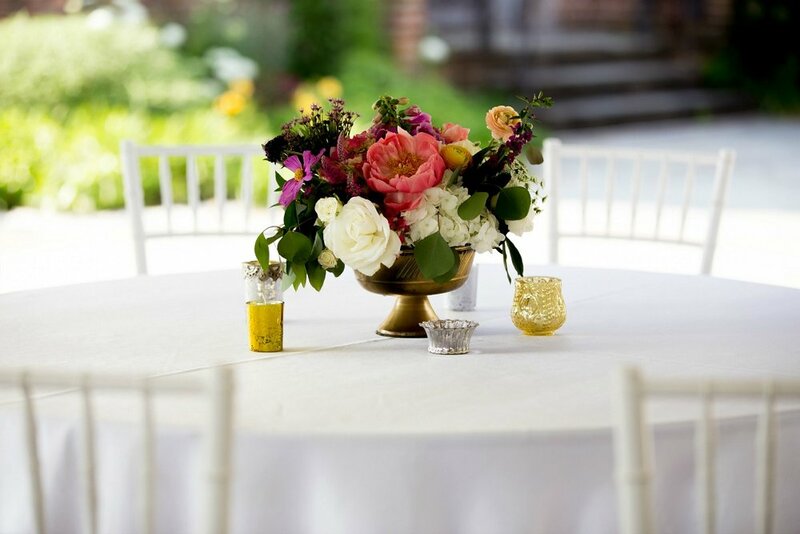 During planning, David wrote, they specifically wanted, "Florals with wildflowers and a setting that would encourage relaxed formalities, so people could interact with each other and the setting. 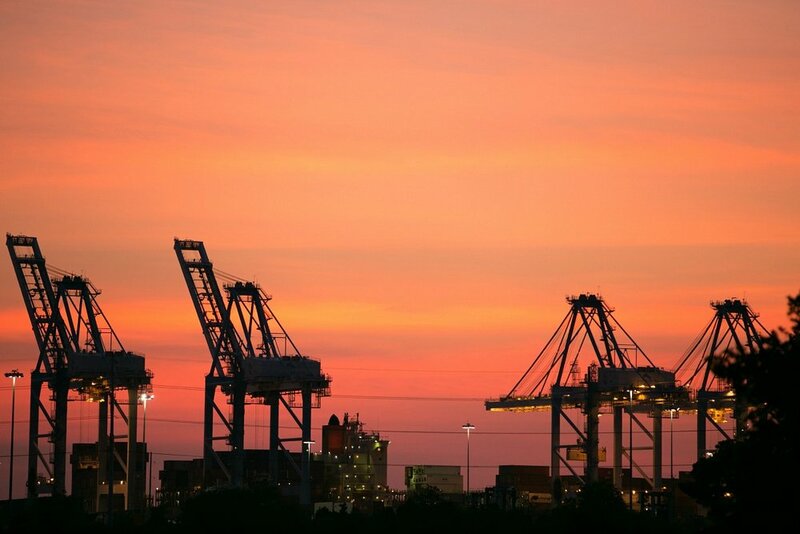 Part of this involved no assigned seating, and strolling refreshments and food." One unplanned aspect of the wedding day was the Art of Burning Man exhibit at the museum that opened just days prior to the wedding. It had a unique link to David, as he and close friends, including best man Peter, had set out for the desert for a Burning Man adventure only nine months before the wedding day. We obviously included a few installations into the wedding day portraits, which happened to be my personal favorites. After sunset, the installations were lit, along with the stately magnolia centered on the back lawn, and ushered in a "festive" atmosphere to the evening. Brandon and David also brought in rainbow elements in different ways. David had rainbow cufflinks, and both wore rainbow-striped socks. At the reception, children were spinning around with pride flags draped around them as capes. 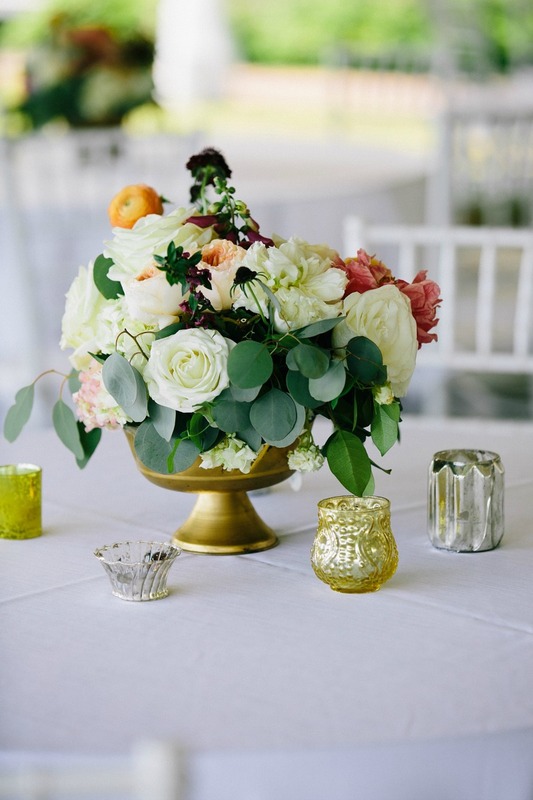 Even the florals were selected to bring in a tasteful, rainbow-inspired palette. Being that Brandon is an accomplished stylist, attire was important. Both suits the couple wore were Paul Smith, and their boutonnieres were wrapped in Paul Smith signature ribbon. (Such a clever touch!) David is a bow-tie lover, so both guys wore unique Seigo Neckwear NYC bowties that complimented their suits. During the cocktail hour, guests sipped on signature drinks-- Brandon's Lavender Cosmo, and David's Mint Julep. Passed hors d'œuvres included herbed Montrachet canapé, lemon grilled shrimp skewers, pepperberry rubbed pork tenderloin, and artichoke and bleu cheese risotto spheres. Wanting to "span several palates" as well as feature coastal Virginia cuisine, the couple decided on having meat, fish, and vegan/vegetarian options. "Because it was an event geared towards walking and interacting, the food choices needed to be vast, mobile, and interesting. One of the central dishes was a whole roasted grouper, pulled to order and served in a bowl with Pungo sweet corn salsa, chipotle aioli, and avocado." Guest favorites included a baby spinach and watermelon salad with blueberries, feta, toasted pecans and raspberry vinaigrette. "Other notables were tandoori chicken skewers, vegetable spring rolls, lump crab with avocado and roasted red pepper puree, and Sriracha-seared tenderloin." My favorite part of the day was the ceremony. 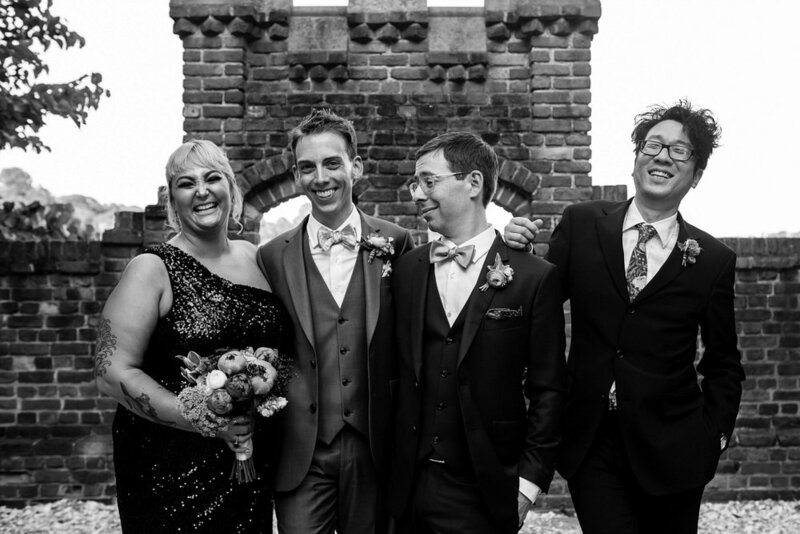 Brandon's best friend & 'groomsmaid', Ashley, sung a gorgeous a cappella version of Somewhere Over the Rainbow, and Peter, David's best friend since college, read a heartwarming poem called "Colors Passing Through Us" by Marge Piercy. Brandon and David each wrote out their vows on cue cards which Ashley and Peter held out for them to read to each other, à la Love Actually. 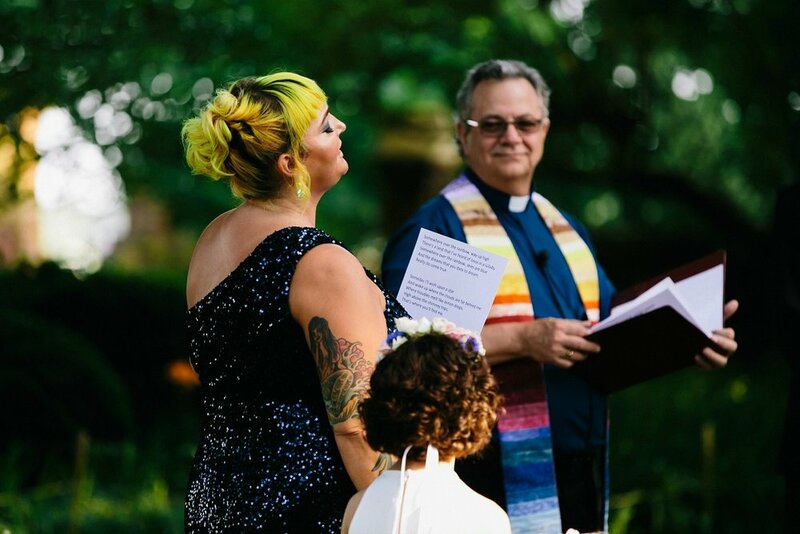 Personalized vows are always one of my favorite parts of any wedding day, and theirs did not disappoint. Brandon vowed to protect David from flannel, cargo pants, and Crocs, and David vowed to do 85% of the driving and to cook for Brandon, especially when he's moody. They both vowed to forgive each other before midnight. The evening ended with fireworks across the water, and the newlyweds exiting under another shower of rose petals. Remembering these sweet details make me want to relive this day again and again. 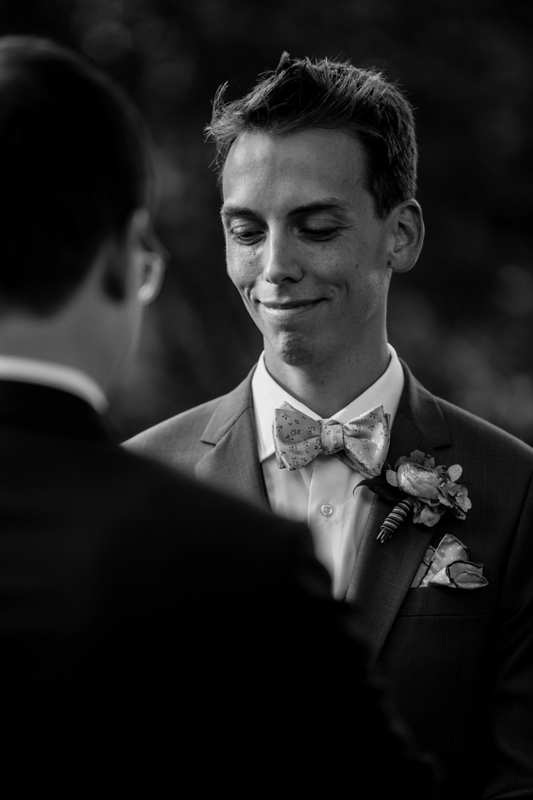 I loved working this wedding with Logan, for us being able to share such a special day. To my guys, Brandon & David, THANK YOU, from the bottom of my heart for allowing us the pleasure to be your wedding photographers, and, more importantly, your friends. You make me proud to do what I do, and inspired to live as whole-heartedly as you do. Little personal touches were everywhere. To add something "extra" to the ring bearer's three-piece suit, Brandon sewed stars onto the arms of the jacket. It was an homage to Madonna, whom he had just worked for on the Rebel Heart tour, and as a lifelong fan. I love this photo of David's dad making a speech, and his sweet response below. As seen in the spring/summer issue of The Knot DC/MD/VA--check it out here and here! AND on the best website for coastal Virginia wedding inspiration, Tidewater & Tulle!